Teresa Woodruff in her lab in the Robert H. Lurie Medical Research Center. Graduate student Maxwell Edmonds, left, and lab manager Chris Will stand behind her. Photo by Tom Maday '95 MA. 1. Visit the Woodruff Lab. 2. Visit the Patient Portal: Find fertility preservation resources and materials. 3. Visit SaveMyFertility: A ­resource for adult cancer patients and the parents of children with cancer who want to learn more about preserving their fertility before and during cancer treatment. 4. Call the Fertline: Find a fertility preservation program closest to you. Dial 866-708-FERT (3378). Karen Springen directs the Journalism Residency program at the Medill School of Journalism, Media, Integrated Marketing Communications, where she teaches writing and reporting. She spent 24 years as a Newsweek correspondent. Through pioneering research in oncofertility, reproductive endocrinologist Teresa Woodruff offers young cancer survivors options to have children. On a recent Thursday, reproductive biologist Teresa Woodruff ’89 PhD, just home from a work trip to India, drove to her lab at the Robert H. Lurie Medical Research Center on East Superior in downtown Chicago, reviewed grant proposals with two of the 32 members of her team and then met with a former colleague who works for a health tech nonprofit run by the founder of eBay and his wife. Then Woodruff sat down with a research assistant professor who helps oversee her many studies. Just before noon, she zipped her MacBook into a purple cover and slung her purple purse over her shoulder. Then she walked to lunch at the Arts Club of Chicago with legal scholar Leigh Buchanan Bienen, wife of former Northwestern president Henry Bienen ’09 H.
Welcome to the world of Teresa Woodruff. The Thomas J. Watkins Memorial Professor of Obstetrics and Gynecology and former president of the Endocrine Society — who has appeared on Time’s list of most influential people and has received the Presidential Award for Excellence in Science, Mathematics and Engineering Mentoring at the White House from President Barack Obama ’06 H — directs Northwestern’s Center for Reproductive Science and its Women’s Health Research Institute, which she founded. This fall she is teaching seven students in the inaugural class of her new 18-month master’s program in reproductive science and medicine, professionals who could become embryologists at in vitro fertilization labs, schoolteachers or future medical students. When she isn’t teaching or doing research, Woodruff advocates for improvement of U.S. health policy. For example, she helped persuade the National Institutes of Health to change its policy so that as of Jan. 25, 2016, females — from animals to people — must be considered in all NIH-funded studies. At a press conference after a September visit to Northwestern’s Chicago campus, NIH director Francis Collins called studying both genders “a critically important issue” and said it has already reduced health care costs “140-fold” by showing what works and what doesn’t work. It all started one day during lunch, when Kibbe shared her promising findings on the use of nitric oxide to treat scar tissue that forms after vascular surgery — and Woodruff asked, “Have you studied the result in females?” Kibbe promptly purchased female rats and reran the study. To her surprise, the female rats needed much higher doses of nitric oxide than male rats. Indeed, adverse effects in women are a leading reason why the U.S. Food and Drug Administration removes drugs from the market and why some popular medications, such as the sleeping pill Ambien, now carry different suggested doses for different sexes. Woodruff is known as a champion for interdisciplinary work and collaboration, within Northwestern and around the world. 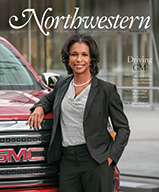 “She’s been very fearless about seeking out people who do work different from her own,” says biochemist Kelly Mayo, associate dean for research at the Weinberg College of Arts and Sciences, who was Woodruff’s doctoral adviser at Northwestern and her collaborator for the past three decades. She has reached out to ethicists, bioengineers, oncologists, even app developers. Woodruff founded and leads the international Oncofertility Consortium, based at Northwestern, an interdisciplinary initiative that includes members in 117 countries and addresses the complex health care and quality-of-life issues that concern young cancer patients whose fertility may be threatened by their disease or its treatment. The consortium also hosts an annual oncofertility conference to discuss science and research and brings together experts in areas such as reproductive medicine, oncology, materials science, bioethics, religion and education to look at mechanisms underlying the fertility threat from cancer drugs and other topics, such as methods for freezing, storing and growing gonadal tissue and ethical and legal concerns regarding the use of fertility preservation technologies in cancer patients. Among Woodruff’s longtime collaborators on human follicle growth is Lonnie Shea, now chair and professor of the department of biomedical engineering at the University of Michigan and an adjunct professor of obstetrics and gynecology at Northwestern. Woodruff knows the biology of the ovary, and he knows how to produce replacement tissues. “There was this natural synergy there,” says Shea. Woodruff also collaborates with Northwestern colleagues in the humanities and social sciences. For example, she is working with Ellen Wartella, communication studies department chair and Sheikh Hamad bin Khalifa Al-Thani Professor of Communication, and Blue’s Clues animator Eric Patrick, an associate professor in the School of Communication, to create “The New You, That’s Who,” Schoolhouse Rock!–like animated cartoons about puberty, reproductive anatomy and menstruation set to original music. Woodruff introduces each cartoon, dressed in her lab coat with a microscope in hand. They’ll be screened at the oncofertility conference in November, and then they’ll be posted on a new website next April and launched through schools and physician outreach. Woodruff is entering the 11th year of her Oncofertility Saturday Academy for high school students, which has expanded to the University of California, San Diego, the University of Oregon and the University of Pennsylvania. She wants the teens to “understand their own reproductive health.” The program brings in a diverse population of high school girls and encourages them to explore basic science and clinical applications and career options in reproductive science, cancer biology and oncofertility. Two alumni became Northwestern undergraduates, and two have gone to medical school, though not at Northwestern. With Harlan Wallach ’00 MFA, associate director of media and design for Northwestern University’s information technology department, she received a five-year NIH grant that has allowed them to create Repropedia.org (a laywomen-friendly glossary that explains terms like amniocentesis and zygote), MyOncofertility.org (her patient-facing site) and the iSaveFertility app. She also created an online class for Coursera called Introduction to Reproduction, which has more than 7,000 learners. “She’s a force of nature,” Wallach says. In 1985 she headed to Northwestern because of the University’s strong reproductive science tradition, with professors like Mayo, who had arrived from the Salk Institute, and physiologist and endocrinologist Neena Schwartz ’50 MS, ’53 PhD, author of A Lab of My Own. “[Teresa] was extremely hard working,” says Mayo. “She had a penchant for doing gigantic experiments. “When she was trying to figure out where a gene called inhibin was expressed, she created 110 slides rather than the usual 10 or 12,” he says. Small wonder that even as a young scientist back in 1988, she published her results in Science, he says. After finishing her doctorate in just three years, with a remarkable nine published studies, she headed to Genentech Inc. in California for six years. In 1995 Larry Jameson, then chief of the division of endocrinology, metabolism and molecular medicine and later dean at the Feinberg School of Medicine, recruited Woodruff back. “It might be one of the first examples at Northwestern where basic science departments were interested in formally collaborating with departments in the medical school with someone who really would have a shared role across campuses,” says Jameson, now dean of the Perelman School of Medicine at the University of Pennsylvania. She moved her lab to the Evanston campus — and then, when her basic research was “ready for translation,” she moved closer to the OB/GYN clinicians on the Chicago campus. 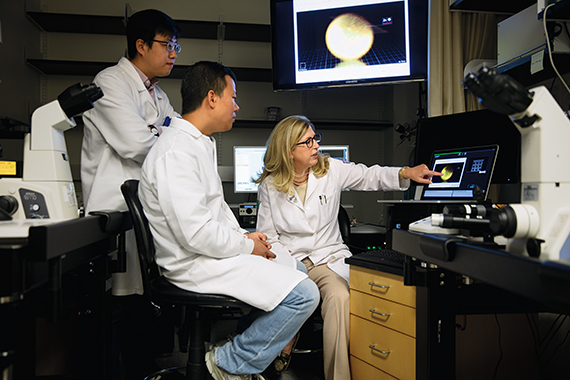 In the Woodruff Lab microscopy suite, Teresa Woodruff and postdoctoral fellows Hoi Chang Lee and Nan Zhang look at images of a mature mouse egg releasing zinc at the time of fertilization. Read more about "The Zinc Spark." Photo by Tom Maday '95 MA. Currently she is looking for answers to how follicle biology works, how the quality of oocytes (single “germ cells” that can become eggs) can be improved and how the results can be “translated” for patients. Many of her questions started with her wanting to make it possible for all cancer patients, including children who have not reached puberty, to keep the fertility door open. Each year 1.6 million Americans, 10 percent of them in their reproductive years, are diagnosed with cancer. And the survival rate for children has risen to nearly 80 percent. The Oncofertility Consortium National Physicians Cooperative, a group of five dozen or so medical centers under the oncofertility umbrella and also started by Woodruff in 2007, freezes cancer patients’ ovarian tissue — 80 percent for the patient and 20 percent for research on so-called “encapsulated in vitro follicle growth,” or eIVFG. The goal is to coax the egg in the follicle to grow outside the body, and then fertilize it and put it back in the woman’s uterus. Enter Woodruff, whose many entrepreneurial ideas include investigating how to make a pill that would protect the ovaries and keep chemotherapy and radiation from damaging them. Woodruff also created a 3-D printed bioengineered ovary and a decellularized hormone-producing implant with her former postdoc Monica Laronda ’11 PhD, now a tenure-line assistant professor within the fertility and hormone preservation and restoration program at Lurie Children’s Hospital, and with materials science and engineering and surgery assistant professor Ramille Capito Shah ’00. Woodruff’s mega-lab receives about $5 million per year in NIH and other funding and employs 18 researchers. “It’s really a small business,” she says. She’s received extensive NIH support for her EVATAR research, which looks at a bioengineered system that includes fluid flow and tissues connected in a newly invented dynamic environment. The EVATAR includes the major reproductive tissues — ovary, fallopian tube, uterus and cervix — and can be used to measure responses to hormones and reproductive hazards and can be used to screen drugs under development. The once science-fiction discoveries are now at the forefront of science and medicine. Woodruff’s paper on the original discovery that ovarian follicles could be engineered to grow in culture and lead to live healthy offspring (in mice) is listed in the top 1 percent of all engineering articles published in the same time period. And her paper describing the new field of oncofertility in the New England Journal of Medicine is in the top 2 percent of all medical articles published in the same time period. Woodruff remains a medical detective, says Barbara Byrd Keenan, CEO of the Endocrine Society, which is giving Woodruff, a past president, its 2017 award for outstanding leadership. 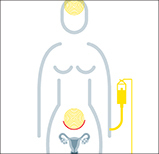 “Women’s system of hormones is probably the most intricate, complex system within the body,” Byrd Keenan says. “We’re still on the cusp of discovery and finding out how we can intervene with those to either prevent disease, cure disease or promote health.” Woodruff is doing all of the above. “I would tell people to keep an eye on her,” says Byrd Keenan.